Those Dam Goblins! Ready to order soon! That’s right, we are only a few days away from this being available for purchase! 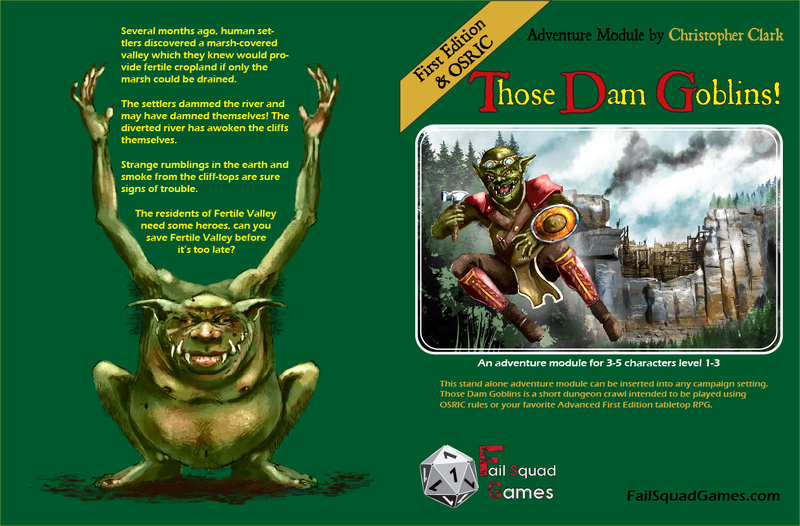 The first OFFICIAL FailSquad adventure module. Several months ago, human settlers discovered a marsh-covered valley which they knew would provide fertile cropland if only the marsh could be drained. The settlers dammed the river and may have damned themselves! The diverted river has awoken the cliffs themselves. Strange rumblings in the earth and smoke from the cliff-tops are sure signs of trouble. The residents of Fertile Valley need some heroes, can you save Fertile Valley before it’s too late? It has been my pleasure, honor and joy to work with Chris on this project and I look forward to pulling the trigger shortly to allow orders to begin. There are a few scant illustrations laft to pop in, some minor tweaking, and a little testing to be sure everything is 100%. I am hopeful that orders can start when July does.